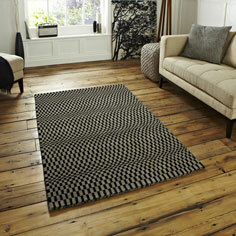 Sonic rugs - Check patterns are simple but highly effective and visually stunning. Our Sonic collection is one of our latest additions to our online wool collection. Loom knotted by hand utilising weaving methods passed down from generation to generation. The pattern creates an optical illusion which creates a wave effect throughout the rug, one word UNIQUE!